The Sierra Madre Tattler! : How Do We Pay City Hall Back For Pushing Development? How Do We Pay City Hall Back For Pushing Development? Mod: Beneath all the phony baloney shape shifting on the development issue, the fact remains that City Hall wants McMansion development at One Carter, Stone House and Mater Dolorosa. As always, it is all about the money. The only real concern for them being the few millions of dollars they'd realize in development impact fees. Our city employee unions are funding their pensions and benefits, and they need the cash. As do their behind the scenes enablers on the City Council. What you might want for Sierra Madre isn't anything they're in the least bit concerned about. It's not their problem. If Mater Dolorosa will get them some of the really big money? Well, then to hell with you, pal. So how do we get their attention? How do we stick it to them like they're sticking it to us? Take away some of their money, of course. One way would be to support the complete abolition of the UUT, which will be on the ballot this November. 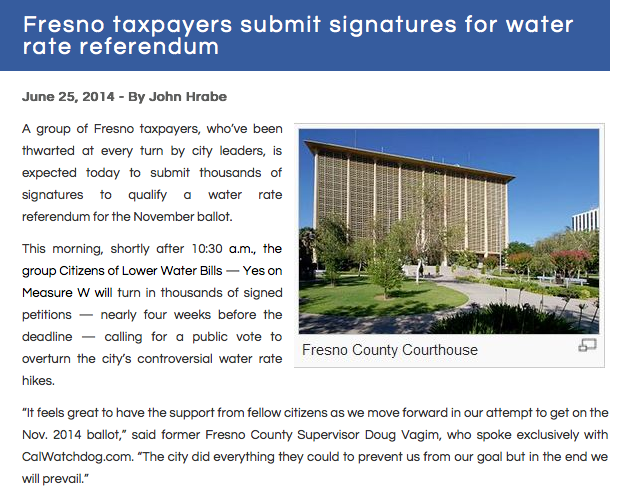 Another good idea would be to rescind the recent water rate increases by putting them on the ballot as well. 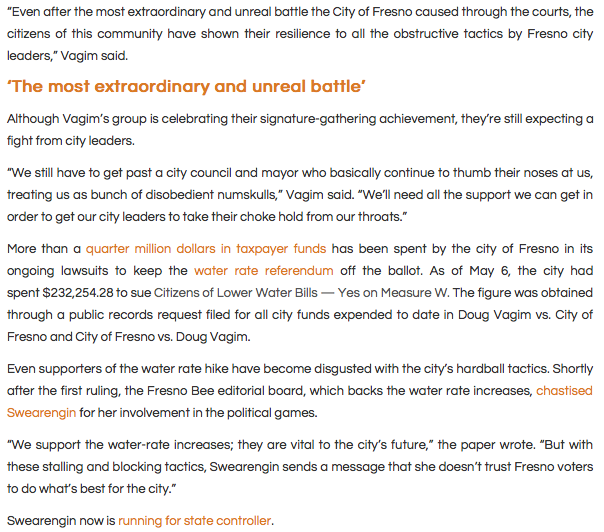 Something the citizens of Fresno are now in the process of accomplishing and, as you will clearly see in this article, they have certainly gotten the attention of their very own local version of faithless city government. The following article comes to us this fine day straight out of the always excellent Cal Watchdog.com site. Link to it here. Stalling and blocking tactics. Sound familiar? How much has the City of Sierra Madre spent in legal fees so far to impose McMansion development upon Sierra Madre? Anyone know? No, nobody does. It is a secret, and you weren't invited. So then, let's take some of that money we have been giving them back. Shall we? Far better that it stay in our pockets than having to watch it being used against our own interests. I'm going to write about it for tomorrow, but here is the link. It is called "Sierra Madre considering stricter measures in face of continued California drought," and it is written by the always thoughtful Zen Vuong. That Gene Goss has taken a "blame the residents" stance here is just about as unconscionable a claim as I have ever heard from a sitting City Council member here. After having endured two successive water rate hikes and water the color of old teeth, the residents of this town have suffered enough. You have to wonder if there is anything inside the man's head at all. We have been scouring the 'Dre in search of signs of an enduring legacy from the Nancy Walsh era. Outside of a few empty storefronts we had turned up very little. But we recently received the following photo from a Nancy Walsh Legacy Project researcher that does offer some insight into that now past and glorious moment in our history. I am certain it seemed like a wonderful idea at the time. I still don't understand how the residents can have a water crisis and be faced with penalties and fines for use but apparently there is no water crisis for developers or businesses such as the laundromat that were granted special favors and rates/unlimited usage without any penalities by Nancy Walsh, Harabedian and Moran. Push back on the city from multiple directions - the city staff wastes hours upon hours on behalf of developers chasing their own tails and residents are placed last in line at city hall. I'm still perplexed how the city charged the Mt Wilson Trail Race over 200 hours in billable staff time supposedly spent in the pre planning on the Trail Race. Just that fact alone which is completely fraud should have everybody questioning the City Manager and push back. If we stop elected lawyer hacks, political wannabee dreamers, developer plants and wishy washy types we'll be alot better off. I use the laundry mat, my house has no hook-ups. I am an extremely low water user, just showers for one. I am the one who will be punished if you limit the water usage at the laundromat. Nothing is ever the City's fault. It is always the residents fault. At the council meeting before this last one, the council voted, unanimously, to rescind the special rate for commercial users. Commercial uses should be treated just like the residents. We're all in this together. Maybe then they will change their turn about the effect over-development has on our water resources. Sierra Madre must be put on a sustainable path. Nancy Walsh's entire 4 year term was primarily about a toilet at Memorial Park and it turns out she wasn't trying to improve the bathrooms, she was trying to take them away to add storage space to the Senior Hall. She quipped here and there with strange rants about how she could do whatever she wanted on Council and volunteers served her and the Council at their own whims, but she always returned back to her special propect - toilets. Don't forget her failed Farmer's Market. Feel free to add to the list of disasters. Its fitting that Nancy focused on toilets because that's where her term as Mayor ended up. No water moratorium? No UUT. The paperwork to put a measure on the ballot that would rescind the remaining 6% of the UUT here in Sierra Madre is being finalized today. If the city decides not to put a real moratorium in place, and not just this "Phase 3" stick it to the rate payer nonsense, then I will vote for it. City Hall needs to understand that there will be some real consequences to their actions. 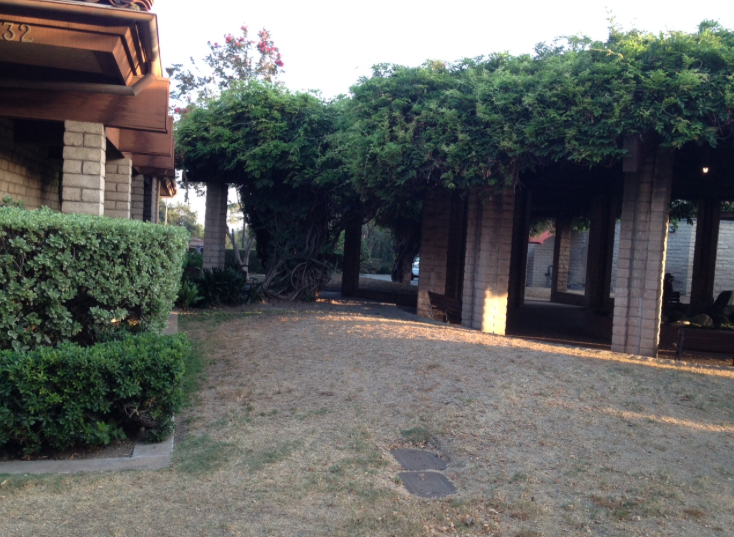 No water for the City Hall lawn, but plenty for three over the top McMansion projects? Yeah, that's a disconnect. I really love what Nancy Walsh has done to the place! I'm not tightening my belt on the water until I know that I'm not doing it to save more water for housing projects. No way, no how. and lucky for all of us, now Mayor Walsh is devoting her energies to the Chamber of Commerce. I hear their next project is being called the Noah Green Flowerpot Initiative. Every empty storefront window in Sierra Madre will soon be sporting a nice new flowerpot. However, due to the water shortage, nothing will be planted in them. I fully support the NGFI process. Is there any state funding? I believe the new Redevelopment Agencies being proposed in Sacramento specifically mention NGFI funding. I have heard that as well. I also understand they have included a plastic flower ban. Goss is right. It is all our fault. We should be ashamed. How are those fine developers going to build 6,000 square foot McMansions if you keep doing things like washing your clothes and making coffee? Shame on you! Goss lectures to us like we are his students at Long Beach City College. Goss is never going to vote against anything the City Manager wants. Never. I think Goss has outside advisors, like the unfortunate Nancy Walsh did, and he's just parroting what they tell him, just like she did. We've reduced our total water usage 5% and new development hasn't come online yet. It's the worst drought in history. Whoever isn't conserving, they are at fault. Goss has already sold out to the developers and he's only been in office a few months. He should be recalled. I thought he ran on preservation when he campaigned for office. Too many politicians change their tune once in office. They say whatever the residents want to hear during the campaign and then their true colors come out once they're elected. Whether its Goss or anybody else, be true to your word. I only hope that Delmar, Capoccia and Arizmendi will have the intestinal fortitude to stand tall for the residents of Sierra Madre. Once Harabedian recognizes that a Phase III is not the same as a water moratorium which does have more "teeth" as he put it, he'll do the right thing. Goss is hopeless. We have at least 3 or 4 votes for a moratorium. At least a few people are looking out for the residents. Water for Sierra Madre- YES ! Water for Developers- NO ! Fines for water users- No! No Water Moratorium? No UUT. 10:09's slogan has a nice ring to it. How about: No Moratorium, No UUT. or: No mo' wells? No mo' money!! Yes! City Hall needs to know that considerable financial pain will accompany their wreckless advocacy of McMansion development. If they keep pushing that crap they need to be fired. And with no UUT revenue left there will be no recourse but to show them the door right out of Sierra Madre. I ain't saving water so that lawyer can help get his client's project built. He wants that project to go foward on our backs. Can you imagine the gall of that guy? Lecturing us to conserve water so that One Carter can go forward. If we knuckle under that guy, we deserve what we get. I would suggest we cut Goss a break. Look, at Tuesday's council meeting, the lights come on, the curtain opens up, the audience is in front of you, and Goss is supposed to come to the right answer on a very complicated issue. How is he or Harabedian supposed to know If the Phase III is sufficent or whether you need to combine that with a Building and/or Water Moratorium. The Council members need to get good information in advance so that they can make a thoughtful and informed decision about what is best for Sierra Madre in light of this water crisis. City Staff needs to also do their homework and get these Council members the best advice possible from the experts. Once Goss and Harabedian get the right information, I'm confident they will come to the right decision. All the council members get a briefing from Elaine prior to the meetings. I'm suspecting at least one of the "possible litigation" pre-council meetings was our City Attorney warning the council members to tread lightly when dealing with any suggested development ban. Will the City Atty's admonition affect the Councilmembers' final vote do you think? And if so, why should a hired employee have more sway over our 5 member curtain of steel than the people they supposedly represent? What is this, the Ironic Curtain? A conscientious council member reads the packet and conducts outside individual study. That way, he or she comes to a meeting fully prepared. There's no reason to cut Goss the slightest bit of slack. He was unprepared and came across like a stooge for development. Goss had an opportunity at the meeting to run to daylight and instead flubbed it. He seemed to be on the same team as that lawyer who doesn't even live in town. Goss needs to wake up and look out for us. He's supposed to represent us and not outside interests. Goss was the only member of the City Council who seemed hostile to the idea of a moratorium. He didn't even think we have a water emergency. If he's wrong about that and continues to vote that way, he should pay a big price if the water situation gets even worse. Goss wants us to let our landscaping die and not take long showers so that developers can build their McMansions. Who are you looking out for Gene? You live in this town for God's sake. Look out for us! I'm not cutting Goss any break. He's too quick to sell out this town to the developers. The nerve of him to want to wait until October to decide if we have a water problem. Why the hell did he authorize $50,000 to that consultant if we didn't have a problem. Drink my water if you don't think we have a problem. We'll never be able to return to our old tried and true water source unless we stop the development that will always insure that our existing wells are inadequate. 9:39, Goss came prepared with his opinion regardless of the facts and if you actually believe that Harabedian will make the right choice for SM, you need your medical marijuana card revoked cause Harabedian was a fraud before he got elected when he photoshopped out police patches in clear violation of the law - he's on the Council for himself and not for you nor I. He appointed himself to the most political groups in the region and is networking himself more than conducting business for the city. When we speak about "developers" in that category includes our local and area real estate agents cause they are just as involved as any land developer in overbuilding SM just for the sake of commissions. Johnny McMayor tells residents: Save water or pay fines. Tells developers: Come on in! The water's fine! " Clean up Sierra Madre! Recall the Mayor now! Thanks for this positive contribution .I love them all! Unfortunately the Trolls are very successful at baiting, then distracting other contributors. We will win or loose this issue based on how many people who do not read this blog, we convince. Arguing side issues among ourselves and responding to the trolls just creates a negative atmosphere that only a few enjoy. The slogans may actually help getting more residents engaged enough to attend the next Council Meeting. If there are other ways of engaging the under-informed residents ,let's discuss . It's a blog, you big silly. Where people come to talk politics, share ideas, crack jokes and have a good time. Usually, that is. What you are asking people to do here is shut up. So, OK. You go first. We need to get more people at the even more important July 8th meeting when the City Council will actually be voting on all of this. If the readers of this blog make the slightest effort and tell ten people and tell them to tell ten people etc..., we wil be unstoppable. That's what we need. Come to the meeting, bring a friend. That's all it takes. Sierra Madre is worth preserving. As of Tuesday afternoon, Betty Yee was again clinging to second place, ahead of former Assembly Speaker John A. Pérez by a mere 865 votes. Whoever survives gets a spot in the Nov. 4 runoff against Republican Ashley Swearengin. California's controller and treasurer have wide-ranging responsibility for state finances. The controller manages cash flow and ensures that bills are paid on time, while the treasurer handles state debt, which includes selling the bonds that fund major projects. Both officials also sit on boards and commissions, including the panels that manage California's two major pension funds for public employees, the largest of their kind in the country. In addition, the offices of controller and treasurer can provide a megaphone for ambitious politicians. 11:25 is a shill for the Democratic party. They just can't stand the fact that she was so successful getting Fresno out of the red, and balancing the budget. And guess what? Many cities have aging infrasctructure that needs to be replaced. That costs money. 1:26 is a little grumpy today. Maybe Sweringin's position on firefighter pensions will cheer you up. Why'd Cal Watchdog go after her do you think? It ain't like they're Democratic Underground. 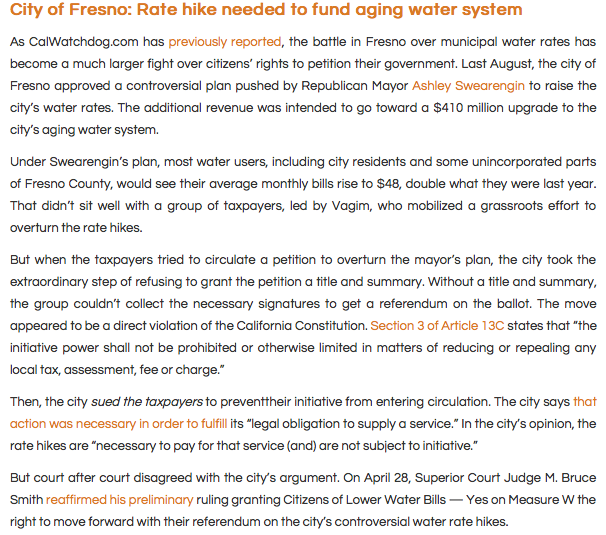 So your ire about having to pay more for water is to punish us all by closing city hall? Which means we would become a ward of the County and lose all control over our development, police, fire, water, taxes, etc? No thank you. Although I already have conserved more than most, I'll pay the fee and keep Sierra Madre a city. Talk about taking money away is just plain foolish. Umm, you missed the point. But only by a mile. The idea of witholding tax money is to encourage the city to not ruin the place with overdevelopment. We keep elected pols who tell us they're in favor of slow growth and preservation (currently Harabedian, Goss and Capoccia) but once elected they do the exact opposite thing. So what else can we do but hit them in the pocketbook? Especially since all that ever seems to happen at election time is we get lied to? Nobody wants to put the city out of business. But what must be remembered is this is supposed to be a democracy. And the will of the people is supposed to be law, but that isn't how it works out. So we have to take their money. It is the only way they'll listen to us. Do you understand what I am saying here? 12:15, I beg to differ. The City cries "we're broke", then the finance director tells the City Council that there's $500,000 (that's half a million $$ for medical-marijuana using Tattler readers) left over from the 2013-2014 fiscal year. That's over 5% of the General fund!! Now that HALF A MILLION was there before they tried to jack up the UUT 25% last April. Remember, when they told us there was no money? Their pants should be on fire. Dear 12:15: Where did you get those ridiculous conclusions? Did you pull them out of thin air? Or somewhere else? Nobody is calling for any of the dire predicaments you list in your comment. You are deliberately misstating the point of today's post. You are bringing a Straw Man to this party, but that dude don't dance in the sunlight. That's the beauty of writing things on a public forum. Tactics like yours may work on talk radio. But you can't shout down the truth here. 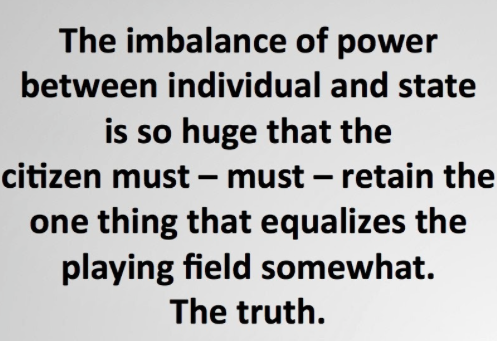 I love the power of TRUTH. 1:43 is probably a member of a public employee union. A disgruntled fireman who doesn't want to contribute to his pension, and shudders at the thought of working past 50 years old. He becomes giddy thinking about retiring and collecting almost his full salary and benefits at taxpayer expense for the next 25+ years, and then starts another career giving him another full income. This guy is a real piece of work, and a misogynist. NO WATER = NO DEVELOPMENT = MORATORIUM! Yeah, MH-- I'm right behind you! Goss is fond of talking about what residents told him when he was out campaigning. It is obvious that the only people he is speaking with these days is the Mayor and City Manager. Goss is incredibly out of touch. Do you think it is possible that certain members of our city council are being bribed by the developers? Possible but unlikely you'd get evidence .Agree with your sentiment but it is an effective distraction from the main issue. What is the main issue -well distraction is #1 for the dark side and they are winning if you read this blog. Yes the wit(?) is entertaining, the moaning understandable. I just hope some bright communications geniuses have a plan of how we are going to engage the undecided Council Members and the uninterested citizens. If this Forum is the wrong place to discuss Action Plans ,tell me where is? I'd rather like to be part of the solution than merely a witty spectator .